Sony unlocks rights to Tim’s Vermeer / It's Just Movies Sony unlocks rights to "Tim's Vermeer"
Sony Pictures Classics has acquired worldwide rights to the documentary Tim’s Vermeer, directed by Teller of Penn & Teller fame. 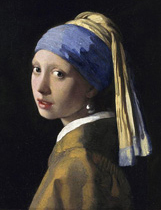 Produced by Teller’s stage partner Penn Jillette and Farley Ziegler, the film follows Tim Jenison, a Texas based inventor, as he attempts to solve one of the greatest mysteries in all of art: How did 17th century Dutch Master Johannes Vermeer (“Girl with a Pearl Earring,” shown at right) manage to paint so photo-realistically, 150 years before the invention of photography? Jenison’s epic research project ultimately succeeds as he uses 17th century technology — lenses and mirrors — to develop a technique that might have been used by Vermeer, supporting a theory as extraordinary as what he discovers. Spanning a decade, Jenison’s adventure takes him to Delft, Holland, where Vermeer painted his masterpieces; on a pilgrimage to the North coast of Yorkshire to meet artist David Hockney, and eventually even to Buckingham Palace, to see the Queen’s Vermeer. Teller has gathered a notable crew including composer Conrad Pope, post-production sound supervisor Larry Blake, editor Patrick Sheffield and director of photography Shane F. Kelly. “Tim’s Vermeer” will be released in 2014.